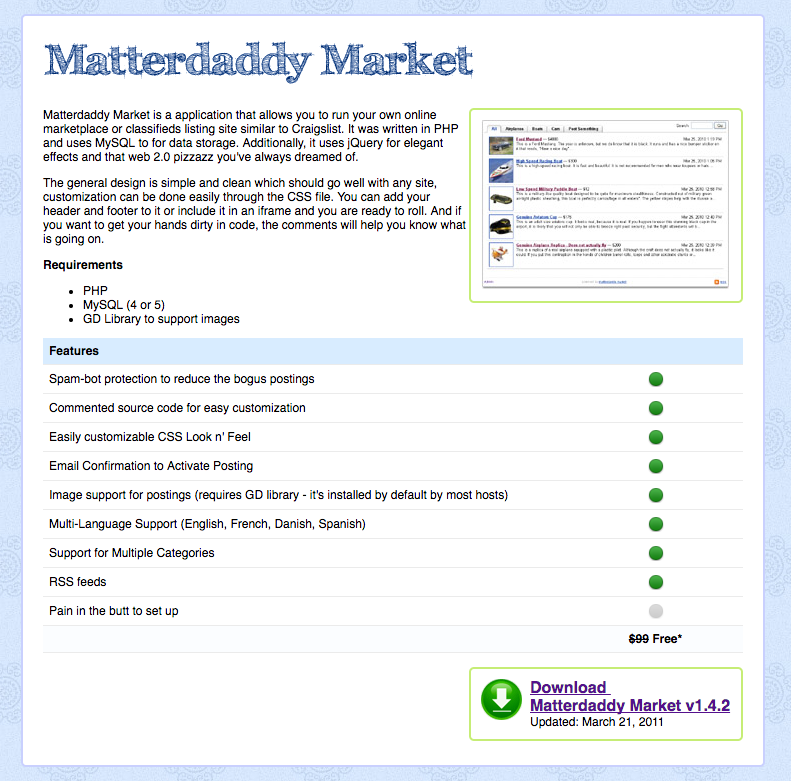 Want to quickly see how the open-source software Matterdaddy Market works? You'll find a free and updated demo installation of Matterdaddy Market here. We are currently updating the Matterdaddy Market demo. Please check back shortly. There will be a new version up soon. Matterdaddy Market is a web application built using PHP as a programming language and a MySQL database to store information. It also make use of jQuery effects to beautify the user experience. Matterdaddy Market is similar to Craigslist and was developed to help create a classified listings website or an online marketplace. Some of the features you will find in a Matterdaddy Market demo site are email confirmation to activate a posting, multi language support, multiple categories, RSS feeds and spam protection. The installation is easy and you can create your own Matterdaddy Market demo by downloading it using the link below. The latest version available for download is 1.4.2 and was released on March 21, 2011.